Six new images from Chandra's vast archive are being released. 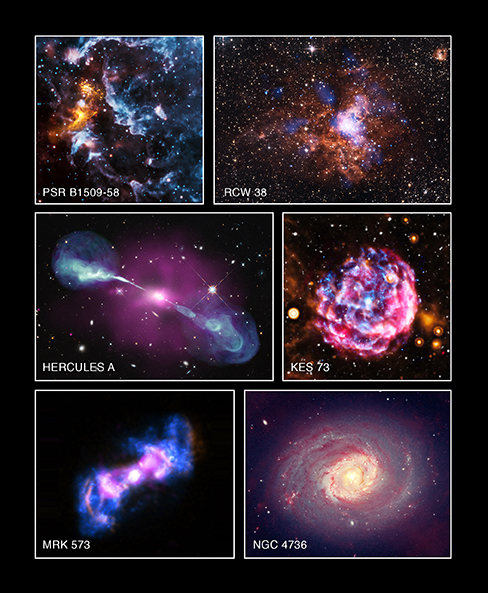 Each of these images combines X-rays from Chandra with data from other telescopes. These images represent a tiny fraction of data that is now housed in Chandra's archive over the mission's 15 years of operation. Every year, NASA's Chandra X-ray Observatory looks at hundreds of objects throughout space to help expand our understanding of the Universe. Ultimately, these data are stored in the Chandra Data Archive, an electronic repository that provides access to these unique X-ray findings for anyone who would like to explore them. With the passing of Chandra's 15th anniversary in operation on August 26, 1999, the archive continues to grow as each successive year adds to the enormous and invaluable dataset. To celebrate Chandra's decade and a half in space, and to honor October as American Archives Month, a variety of objects have been selected from Chandra's archive. 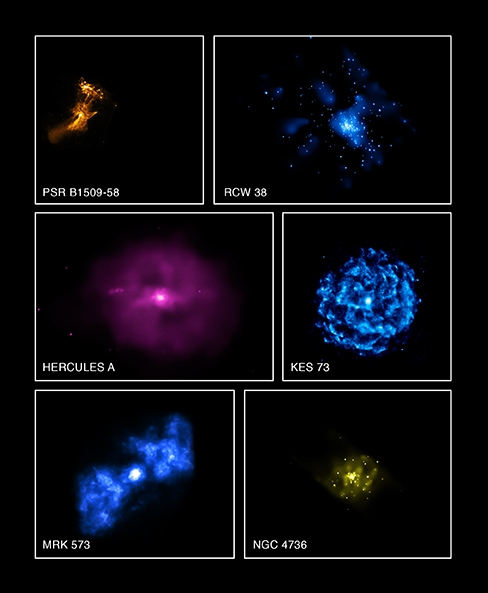 Each of the new images we have produced combines Chandra data with those from other telescopes. This technique of creating "multiwavelength" images allows scientists and the public to see how X-rays fit with data of other types of light, such as optical, radio, and infrared. As scientists continue to make new discoveries with the telescope, the burgeoning archive will allow us to see the high-energy Universe as only Chandra can. Pareidolia is the psychological phenomenon where people see recognizable shapes in clouds, rock formations, or otherwise unrelated objects or data. 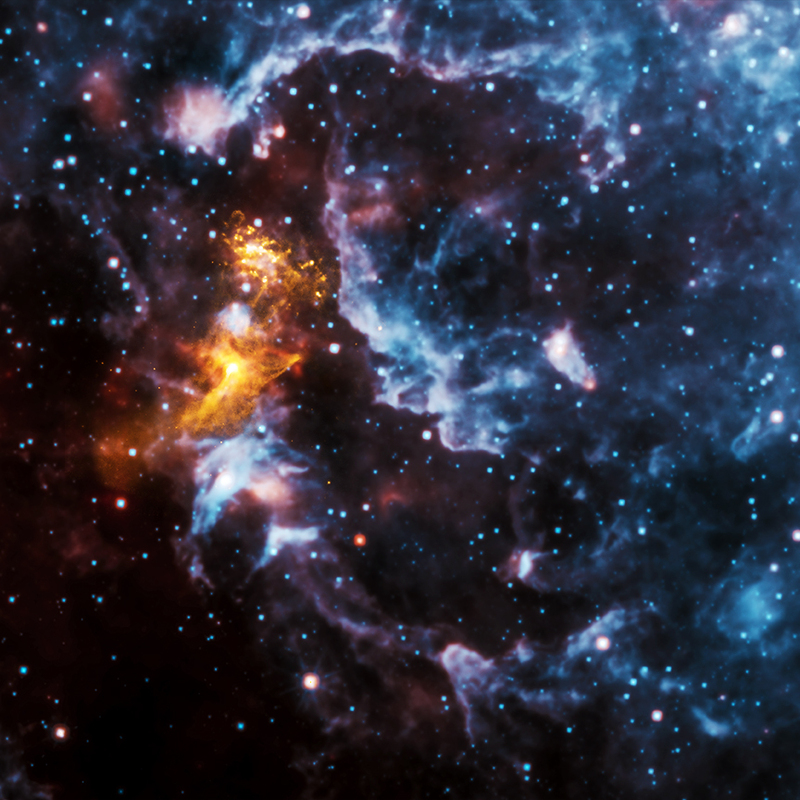 When Chandra's image of PSR B1509-58, a spinning neutron star surrounded by a cloud of energetic particles, was released in 2009, it quickly gained attention because many saw a hand-like structure in the X-ray emission. In this new image of the system, X-rays from Chandra in gold are seen along with infrared data from NASA's Wide-field Infrared Survey Explorer (WISE) telescope in red, green, and blue. Pareidolia may strike again in this image as some people report seeing a shape of a face in WISE's infrared data. A young star cluster about 5,500 light years from Earth, RCW 38 provides astronomers a chance to closely examine many young, rapidly evolving stars at once. In this composite image, X-rays from Chandra are blue, while infrared data from NASA's Spitzer Space Telescope are orange and additional infrared data from the 2MASS survey appears white. There are many massive stars in RCW 38 that will likely explode as supernovas. Astronomers studying RCW 38 are hoping to better understand this environment as our Sun was likely born into a similar stellar nursery. Some galaxies have extremely bright cores, suggesting that they contain a supermassive black hole that is pulling in matter at a prodigious rate. Astronomers call these "active galaxies," and Hercules A is one of them. In visible light (colored red, green and blue, with most objects appearing white), Hercules A looks like a typical elliptical galaxy. In X-ray light, however, Chandra detects a giant cloud of multimillion-degree gas (purple). This gas has been heated by energy generated by the infall of matter into a black hole at the center of Hercules A that is over 1,000 times as massive as the one in the middle of the Milky Way. Radio data (blue) show jets of particles streaming away from the black hole. The jets span a length of almost one million light years. The supernova remnant Kes 73, located about 28,000 light years away, contains a so-called anomalous X-ray pulsar, or AXP, at its center. Astronomers think that most AXPs are magnetars, which are neutron stars with ultra-high magnetic fields. Surrounding the point-like AXP in the middle, Kes 73 has an expanding shell of debris from the supernova explosion that occurred between about 750 and 2100 years ago, as seen from Earth. The Chandra data (blue) reveal clumpy structures along one side of the remnant, and appear to overlap with infrared data (orange). The X-rays partially fill the shell seen in radio emission (red) by the Very Large Array. Data from the Digitized Sky Survey optical telescope (white) show stars in the field-of-view. Markarian 573 is an active galaxy that has two cones of emission streaming away from the supermassive black hole at its center. Several lines of evidence suggest that a torus, or doughnut of cool gas and dust may block some of the radiation produced by matter falling into supermassive black holes, depending on how the torus is oriented toward Earth. Chandra data of Markarian 573 suggest that its torus may not be completely solid, but rather may be clumpy. This composite image shows overlap between X-rays from Chandra (blue), radio emission from the VLA (purple), and optical data from Hubble (gold). NGC 4736 (also known as Messier 94) is a spiral galaxy that is unusual because it has two ring structures. This galaxy is classified as containing a "low ionization nuclear emission region," or LINER, in its center, which produces radiation from specific elements such as oxygen and nitrogen. Chandra observations (gold) of NGC 4736, seen in this composite image with infrared data from Spitzer (red) and optical data from Hubble and the Sloan Digital Sky Survey (blue), suggest that the X-ray emission comes from a recent burst of star formation. Part of the evidence comes from the large number of point sources near the center of the galaxy, showing that strong star formation has occurred. In other galaxies, evidence points to supermassive black holes being responsible for LINER properties. Chandra's result on NGC 4736 shows LINERs may represent more than one physical phenomenon. NASA's Marshall Space Flight Center in Huntsville, Alabama, manages the Chandra program for NASA's Science Mission Directorate in Washington, DC. The Smithsonian Astrophysical Observatory in Cambridge, Massachusetts, controls Chandra's science and flight operations. In a galaxy, such as Hercules A, would the jets eliminate the chances that a solar system, containing life, could exist? I love this game, it's awesome, when I grow up I want to be a scientist. Thank you for giving us the arxiv links. Many of your presentations are definitely worth be studied more deeply. Thanks a lot Chandra for 15years of science discovery and thanks for making our path to the future lighten. Terrific look at cosmos from Chandra.